Fortunately we have seen a recent interest in the subject of bullying and how to deal with it as it relates to our children. This awareness has filtered into the workplace and other social aspects of our lives. Bullying in the form of abusive leadership should also be dealt with inside the church congregation. To start, let me clarify that I am a very strong proponent of people gathering together on a regular basis for teaching, worship, encouragement, and spiritual-maturity building activities. The Bible teaches us that we should not put off gathering together for spiritual growth (Hebrews 10:24, 25). But I also know that some church situations are rife with abusive leadership. 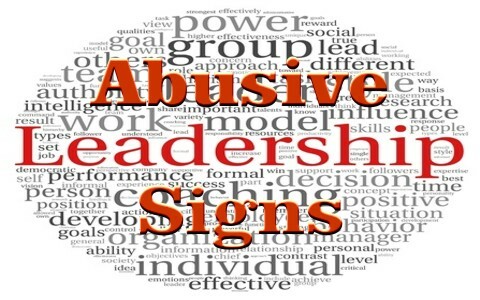 Let’s look at some signs of abusive leadership and see if we can be helped by recognizing these signs and avoiding these leaders or working to change the behavior. I do believe it is possible that some church leaders don’t realize what they are doing to their congregation. They are leading in the manner in which they were taught and don’t know that there is a better way. Of course, in true cult situations there is no interest in changing because abusive leadership goes hand-in-hand with the definition of a cult. I am talking about church leadership, but these signs of abusive leadership can be found in many other areas of life. Abusive leadership is typified by the leader holding unquestionable authority. The congregants are not allowed to question the actions or teaching of the leader. They feel threatened when someone is more spiritually mature than they are. Good Leaders: Good leaders see questions as opportunities to teach the truth. They are willing to explore the question with those who raise them. Good leaders never say, “because I said so.” They want the congregants to grow spiritually and would be thrilled for anyone in their congregation to grow to the same level of maturity as the leader. They seriously consider the responsibility they have to help their people grow (Hebrews 13:17). When there is a strong emphasis on confessing sins to the leader or to his close allies, then there is a spirit of manipulation present in the congregation. Abusive leaders tend to hold “blackmail power” over their followers. They get this power by insisting to know these things about the congregation that are secret to others in the church. Good Leaders: There is help and healing that can come from confessing your weaknesses to others (James 5:16). But a good leader is not going to manipulate or guilt you into confessing your sin. A good leader will pray for you and your weakness, but he does not need to know the sordid details of your activities. Abusive leadership craves titles and various levels of authority under them. They want their followers to know that each one has their place and who is over whom. There is usually a very obvious pecking order. Partiality comes in the form of honoring others simply because of a title or way they dress. James specifically warns us about this in James 2:1-9. Good Leaders: There is certainly nothing wrong with honoring people for accomplishments, but a good leader will work to avoid partiality as defined by the book of James. Good leadership wants to see each of the congregants grow in their spiritual maturity. Not everyone in the church will mature at the same rate and therefore the more mature can be used to disciple others to greater faith. But this should not be used to create a superiority of one group over another. A sign of abusive church leadership that I have seen all too often is the thought that “our church is the only good church in the area.” My stomach turned flips in the lobby of a church when I heard one of the church leaders tell me, “besides ours, there is only one other good church in the Atlanta area.” Red flags immediately popped into my head. Needless to say, I had trouble enjoying the church service that morning. I spent the whole morning over-analyzing everything that was taught. Good Leaders: A good church leader will recognize, and promote the fact, that there are many good Christians in other congregations around them. Maybe another church does not conduct church services exactly like theirs, but good leaders realize that God works with different people in different ways. Their own congregation may truly be the most spiritually mature one in the area, but they will not criticize other congregations to the point of threatening their people to keep them away from other churches. Abusive leaders will not allow others to teach or preach in their church. They believe they are the only ones who can train others. They may have other Sunday School teachers, but the curriculum is tightly controlled by the pastor for his own purposes. Good Leaders: Knowing that the exercise of studying to teach others will help people grow, a good leader will allow, and actively encourage, others in the church to engage in discipleship and teaching opportunities. There are times when a good pastor knows someone is not ready to teach on their own and still needs training. This is where a good curriculum can be placed in the hands of the teacher. Also, there are times when the leader wants everyone to study the same material for continuity in the lessons. There is nothing wrong with a good curriculum. But there is something very wrong with the leader insisting that no one ever deviate from the material prescribed to them. In an abusive situation there is great pressure to obey the leader and his teachings. Conflicts are not usually handled in a quiet and discreet manner. Anyone who goes against the leader’s authority is publicly shamed for their actions. Then they are cut off from the congregation and treated as outcasts. Those who are still in the flock are warned to not have any interaction with those who have been shunned. Good Leaders: The Bible does teach the practice of church discipline in Matthew 18 and 1 Corinthians 5. However, this should be done in a loving way with the intent to restore the person and their relationship with the church and with God. Church discipline is first restorative. If necessary it may be elevated to the point of banishment. But it should never be used for the purposes of manipulation. An abusive leader takes on the role of the Holy Spirit in the church. They try to cause a level of guilt that will make their followers live in obedience to their rules. This type of leader is always looking to catch someone doing wrong instead of looking for what people are doing that is right. Good Leaders: A good leader will allow the Holy Spirit to do His part in the life of the believer. This leader will trust that God knows how to deal with the wayward sheep. There must be teaching from leadership on how a Christian should live according to the Bible, but their role is instruction, not enforcement. As I mentioned at the beginning, sometimes these leaders don’t know that they are being manipulative. They may become great spiritual leaders if someone will take the time to teach them. Maybe God would have you try to help them mature in their leadership style. If possible, you should attempt to help them grow as leaders. Unfortunately, there are also those who intentionally engage in abusive leadership and refuse to listen to reason or to consider they need to change. The right way to handle this is to quietly leave and find a congregation where God can help you grow spiritually. It is best not to cause a mutiny or mass exodus from a church. Trust that God will lead others as necessary to leave the church. It is too easy to take on the abusive leader role in your quest to bring others out of a bad church situation. I trust God will give you wisdom in your situation as you seek His leading in this emotionally charged and spiritually important matter. More reading about leadership: What is Servant Leadership? Thank you for your article. Throughout the articles on abusive churches that I’ve read on the internett, “Public shame” is a constant. I was stalked, shamed, and now shunned by a church of a major denomination that I visited (was not a member) for a once-a-week workshop last summer. Here is my Facebook post; feel free to share.